As we all know, Huawei and Samsung are two big on manufacturing high-end Android devices. Lately, Huawei released its new flaship, the Huawei P10 and P10 Plus, while Samsung has unveiled the great Samsung Galaxy S8 and S8 Plus as well. Both phones are great and worth buying, you can simply choose a preferable one from them if you want to upgrade your phone. If you used to be a Huawei Android user, this time you can switch to a Samsung Android phone for new experience. And this article is here to help you easily switch your Huawei Android phone to Samsung Galaxy S8 or S8 Plus. Transfer contents include contacts, messages, call logs, music, photos, videos, apps, notes, ebooks and more. Recover iTunes/iCloud backup to iOS or Android devices. Sync contents from iTunes Library to PC and devices. Multiple OS supported: multiple phones run Android and iOS. Step 1: Free download and install this Samsung Data Transfer tool. 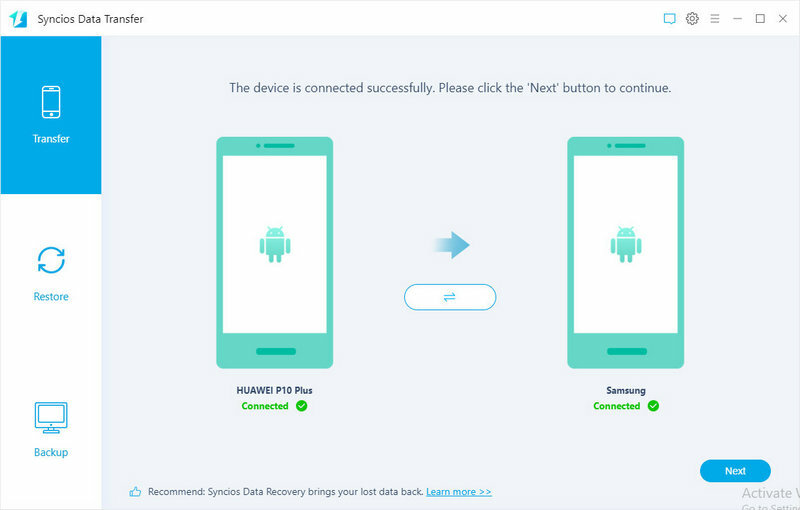 Connect both your old Huawei device and new Galaxy S8 to computer and launch Syncios Data Transfer tool. Scroll down the phone screen and get both of your phones USB debugging mode enabled. You can also connect both of your phones via WiFi networks. To transfer your data from old Huawei device to the new Samsung Galaxy S8/S8 Plus, simply choose Transfer module and click "Next". 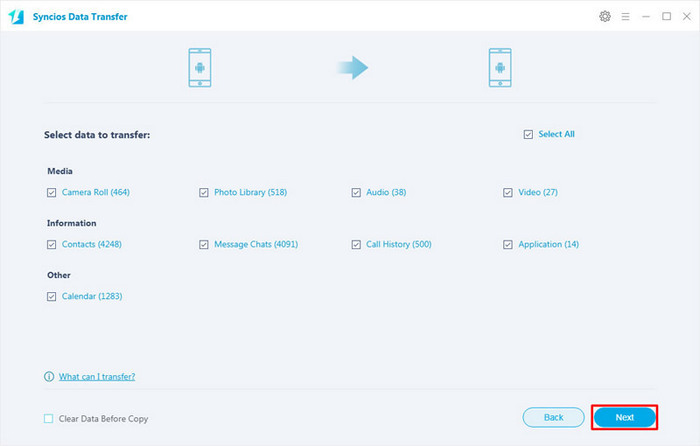 Syncios Data Transfer would start loading all your data on both devices automatically after connected successfully, you can then simply check desired items on the middle panel to sync, make sure your old Huawei phone listed on the left while the Samsung S8 on the right, you can exchange them by clicking Flip. Then click on Next button to start the transfer process. After a while, all selected data would be synced from old Huawei phone to Samsung Galaxy S8/S8 plus successfully. You should be noted that please make sure both of your phones have stable connection with the computer, do not disconnect either phone during the transfer process in case of unknown errors. And if you encountered some problems while transferring data to your new Galaxy S8, please feel free to contact us with Email. We are glad to hear from you.